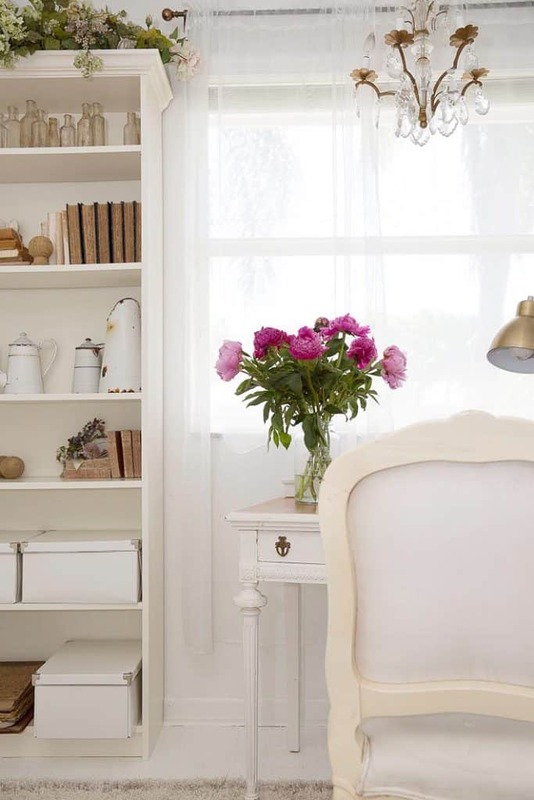 If you are looking for a French modern home office, it’s not that difficult to make it happen. If you can envision it, you can do it. I’m just here to help you discover a little bit of that hidden talent along the way. And like I always say, update to your own style and comfort. Your office is important and should be a place that comforts you and helps you stay focused. Keep it clean, uncluttered and suited to your taste! My secret? If you read the article showing my French Modern Home Office Reveal, all of those shots were done via iPhone very quickly for reveal day! One of our daughters was due in for a visit from out of town, and this (her former bedroom) also serves as a guest room with a fabulous bordering luxe inflatable bed. This weekend I had the time to shoot a few photos with my camera. Now that I’ve been in the room for several months I’m ready to talk! I spend AHH LOT of hours working in here and the room is functional, flexible, comfortable and bright. Those are all so important to great design and not necessarily being on trend or having your rooms like everyone else’s. I love a great chandelier. If it can be an old one versus a reproduction, all the better in my book. The chandelier that we swagged over my desk is old. 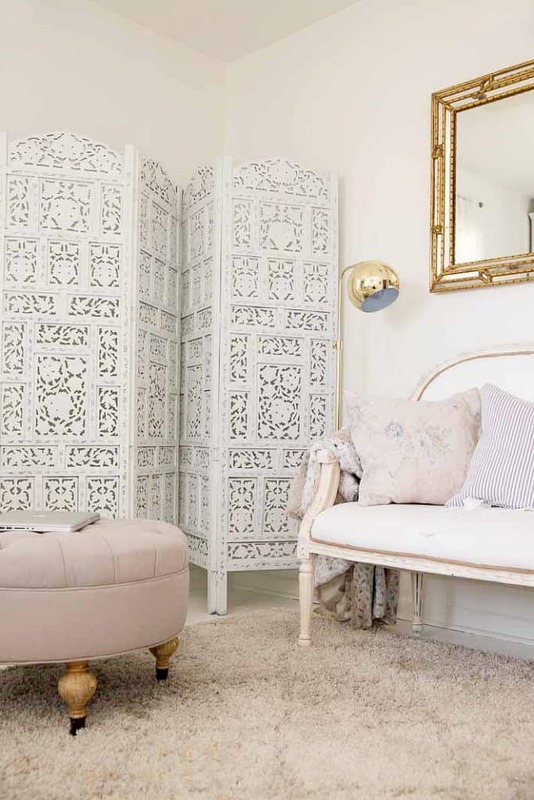 It’s French and just the right petite size for this space. I rewired it to U.S. standards and it’s a treasure. My small antique French writing desk is working out just fine for my needs, especially since I downsized my collections, got rid of a lot of unnecessary objects. I use the built-in closets that are part of this former bedroom for storage. Nowadays most of our writing is done on a device. My laptop work is either accomplished at the desk or sitting on the settee with my feet on the ottoman. There are two windows in the room for plenty of light and the one is behind my desk faces the circular driveway and street in front. While I’m working I can keep a pretty good eye on things around here! The white painted floor is one of the best things that I’ve done in this house and it covers up a multitude of sins from a worn parquet floor that has had its share of abuse! Using the porch paint and the technique that we used and it’s holding up very well so far. The dogs all hang out with me here and sleep on the rug, which is a Moroccan trellis design found here. I’ve cleaned it with my rug cleaning machine once so far and it came up just like new. THIS ottoman is so perfect in every way for my home office and it’s used as a table, footrest and the dogs pop up on it to hang out as well. I love that it’s on wheels. Any small stains that may have appeared are easy to wipe off with a damp Magic Eraser pad. 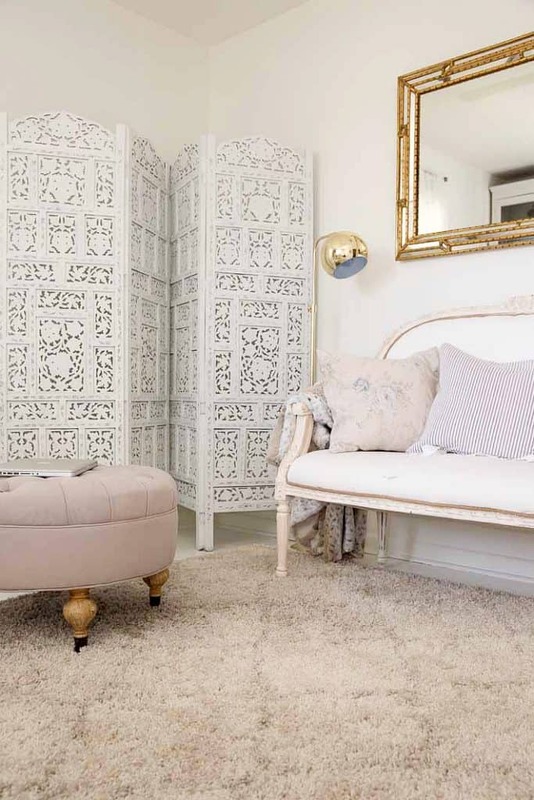 Same for the French settee that I talked about in THIS POST...It get’s use and although there are those that say white doesn’t work, that is simply not so because it can be wiped clean with bleach to look like new. I hope that you enjoyed my review today and if you did, I’ve provided the links to some similar posts below. I love what you did. I need to do little work on mine. Thanks for sharing. This is very “funny” … the idea that american people have on french things (such as decoration). 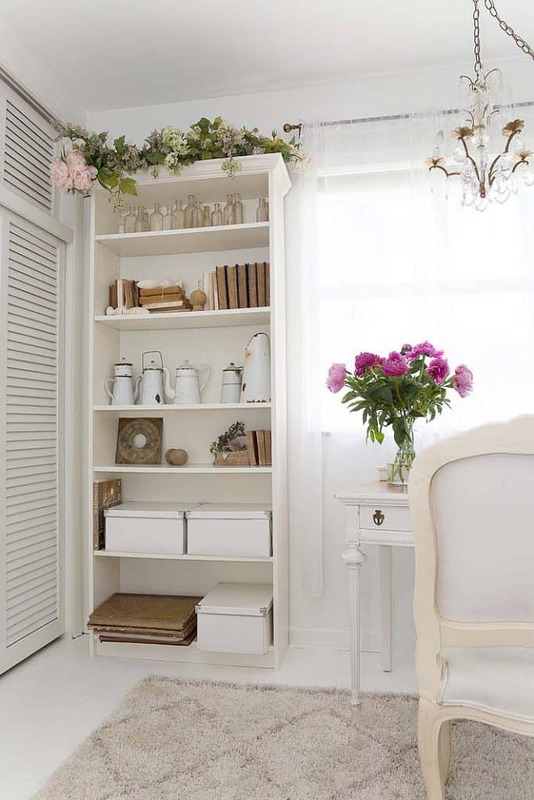 All your “french style” decorations are …. 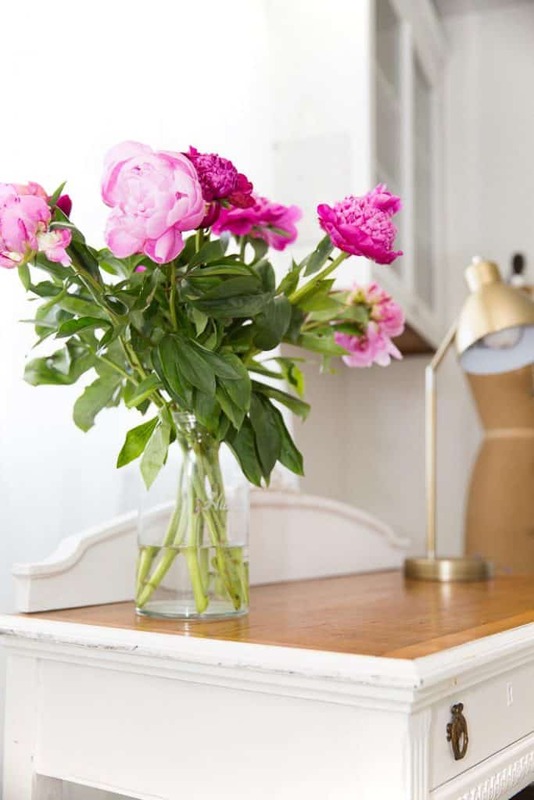 romantic (I know that French are supposed to be romantic..) but our office spaces are not romantic, they are functional (dull) and – still – very few people work from home… this might be one of the reasons…. Anyway, I love the ways you do your home decoration…. it is bright with light, open, with beautiful objects and not overloaded..
Love the office transformation Janet! The whole room is gorgeous, and SO me;) I could easily work in here all day! It definitely makes me excited to be done with my ORC in a couple weeks when I’ll have an office of my own! Oh My Golly, that has to be one of the prettiest home offices I’ve ever seen. I could have some major inspiration working in there. Seriously beautiful. A lovely room! 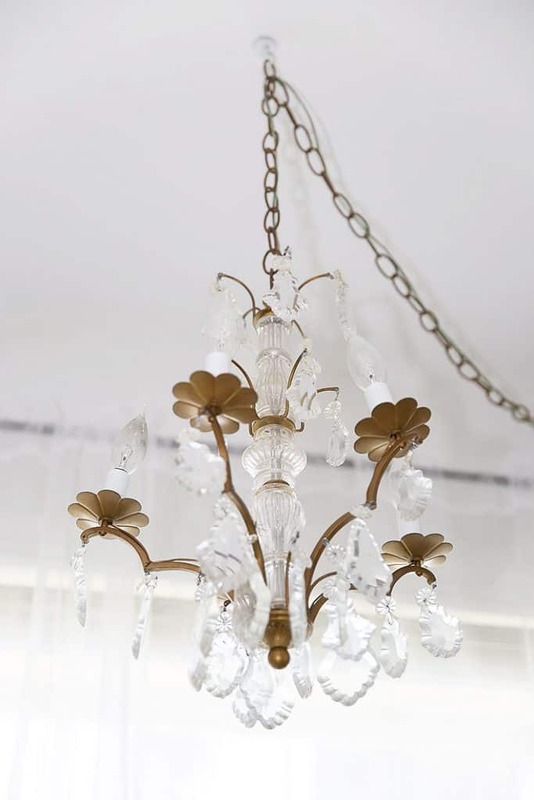 I’d love to hang a chandelier in a room with no ceiling outlet, where does your electric line go? I have it swagged Mary and put a plug on the end of it, so it simply plugs into the room outlet. I also installed a dimmer switch on the plug, since I have made/sold lots of chandeliers over the years. You could get someone to do this for you if you aren’t confident with electrical. Beautiful! I have a very similar desk and have been looking for a desk lamp just like the one you have. Can you share where you purchased it? Janet, I still love your new office. Your office looks tranquil easy. Thank you Barbara…I love working in this quiet space. Looking around for a new chair though and will have to share again!